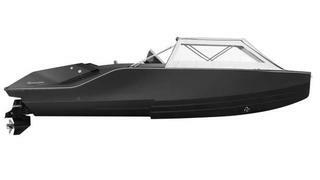 Austrian shipyard Frauscher has introduced an open bow version of its 747 Mirage Air superyacht tender. With stealth jet looks, the 7.47 metre Frauscher 747 Mirage launched last summer and debuted at the Cannes boat show 2014. Both versions share impeccable fit and finish, but the new open Mirage Air model boasts a flexible centre console layout, which adds to the way she can be used on the water. Not just good-looking, speedster day boat, but for sunning and water sports as well. The 747 Mirage was inspired by a super car, both in looks and performance, and she delivered with a 56-knot top speed powered by 430hp Volvo Penta diesel engine. And the distinctive air intake is built in carbon fibre. Frauscher's head of R&D, Thomas Gerzer, conceived and developed the 747 Mirage Air. The new boat is based on the proven hull of its predecessor, which is designed by hydrodynamic expert Harry Miesbauer, and also carries forward many of the attributes of the first, which flies from the drawing boards of KISKA Design. What the open bow version offers beyond its sibling is more freedom – access to the bow, firstly, for easier docking, and beyond this there is plentiful storage in bow and side compartments. An easy-to-deploy bimini top that covers the bow area is a nice touch, allowing sun worshipping or shade at will. A lounge package provides cushions, which can be added to the bow section to create a bigger sun pad or used as a table. The sun pad at the stern can also extend by flipping down. Clients have a plethora of exterior and interior colours to choose from to customise their superyacht tender. The Frauscher 747 Mirage Air is also available in a variety of power packages ranging from 220hp to 430hp, including three different Mercruiser engines and a Volvo Penta Diesel option, with the possible top speed matching that of the original at 56 knots. The Frauscher 747 Mirage Air will make her debut at the Austrian Boat Show in Tulln, and first customer deliveries are scheduled for summer 2015.